Discussion in 'Houston Rockets: Game Action & Roster Moves' started by PigMiller, Feb 8, 2017. I know this has been a theme on this board before, but seriously, as a rabid fan of this franchise, it is utterly embarrassing every home game...and especially when we're on national TV. The sea of empty red seats at tip off of EVERY game is disgusting. I'm surprised that more commentators haven't made mention of it...the only time I can really recall is recently on ESPN when "severe weather" was the excuse for what was just another home game on the schedule. Yes, it does somewhat fill in throughout the game and is "decent" by mid-fourth quarter, but once it does there is still no energy in the building at all. And after the fans have actually shown up by late first quarter, they still can't be bothered with actually being a fan. 12-0 run that leads to a timeout for the other team? Barely an audible applause. James with 40 and a late-game substitution for an obvious standing ovation? Meh. Rockets on their way to another win and are dribbling out the clock in the 4th? Can't even be bothered to show appreciation. Reasons for the empty seats have all been covered before (prices too high, too many corporate tickets in the lower bowl, tip times moved up from 7:30 to 7:00, a downtown arena not convenient to get in/out of, among other things), but just curious...does it make anybody else cringe at the mere thought of the scene at tip-off and lack of energy from the fans at home games, especially on national TV? Voice of Aus, Gorki, Lawlruschang and 10 others like this. I like the $1 beer before tip-off promotion they did last week. Do it for every game. Richie_Rich, douglasreedy1, Raider17 and 6 others like this. They "ran out" at like 6:15. I don't see how they could "run out" then sell me a full priced draft beer right afterwards smh. Anyways, to me it just means people actually have jobs in this city. I'm as die-hard a Rockets fan as any, but it's really hard to make it to the arena by 7 after work fighting through traffic. Weekends - no excuse. Rocket Freak, douglasreedy1, hakeem94 and 7 others like this. Annoying, yes. But what does complaining and b****ing about it do? Buy the tickets yourself, sell em at half the cost or give em away to "real-fans" who will stand and cheer if it appeases you. Daddy Long Legs, adeelionaire, juanm34 and 1 other person like this. what do you expect, we're normal working city and it's really impossible to get there on time at 7 with all the traffic. As long as we have 1 or 2 of these per game, I'm good. No cringing here. Daddy Long Legs, RocketWalta, Von Rafer and 1 other person like this. But we don't. Les needs to put Morey in charge of picking the Red Rowdies and they should move around each game. douglasreedy1, hakeem94 and RasaqBoi like this. I am not surprised the library stays empty & quiet. It's embarrassing but it is what it is. Minute Maid Park has been & will be sparse as well. CoH: I'm just not that into you. Richie_Rich, DudeWah, alethios and 3 others like this. 7:00 is a good excuse since by 7:30 the arena is rampant. Seriously, I wouldn't mind later starts. "Running out" of beer is funny and not surprising. It's pretty bad for sure. It has been for as long as I can remember. If you can figure out an actual way to change that- short of drastically reducing ticket prices- I'm sure Les Alexander would give you a job for a lot of money. This isn't a Rox problem, its a league problem. The nba should stretch out the schedule and make these games mean something. I guarantee you if each team played only two games a week on Sat/Sunday or Wed/Thurs, not only would arenas be packed there would be better quality of play. Richie_Rich, douglasreedy1 and heypartner like this. I Hate going to th games early only cuz I feel like I'm the only one there lol and then when I get rowdy, some people look at me like I need to calm down.. wtf.. go watch the game at hom you lazy sob! Rockets4Life13, Gorki and RasaqBoi like this. Do you mean reduce the schedule? Stretching 82 games to twice/week makes a 9-month regular season. How short should the offseason be? I live in Brazil and was lucky to have a business travel to Houston in 2015. I was also lucky enough to have a home game against the Blazers in that weekend. As it was my dream to be at a home Rockets game, I wanted to have the best seat available. I was willing to pay high for it, for sure. Two months before the game, I bought a ticket, section 121, but in the last row. The cost? $350. After that, I understood why home games has too many empty seats. It´s a business. Unless Le$ really sees that he needs to change that to increase income, it won´t change. IvanLCPM, RocketWalta and slothy420 like this. Stretching 82 games to twice/week means regular season is over 9 months. Man, I feel exactly the same. I don't know the solution but the management just have to address it. I see Less in every game lately. There is no way it's not bothering him as well. Richie_Rich, Gakatron, dvr4me and 3 others like this. He doesn't care. Many of the seats are sold. We are the 3rd or 4th largest market team in the NBA, it's pretty absurd that the team can't figure our a way to sell the seats AND have them filled on time consistently. People always talk about how it's all about football, but the marketing is poor. It's almost as if they have given up and accepted their fate that this is the only way. The NFL and Texans are wiping the floor with the marketing the Rockets do. Not saying every game should be sold out, but in a season where we're winning this much and we have the best player in the world and we are playing an exciting brand of basketball, it's not acceptable and whoever is heading up marketing can't be happy with their effort. During games on TV, the attempt at selling tickets is bland and boring. It's not indicative of a team that needs to break a cycle, that needs to differentiate itself. The halftime shows are mediocre at best. Mostly copying others instead of innovating anything. The cheerleaders are good dancers, but they don't put on a more impressive show than most. Effort is there, but funding and creative space is not. Social media is so meh. TV spots look like they're from the 90's. They should be better. But again, a business aims to make profit, and once the profit is there, the motive is gone. If those seats are in fact sold, little will change, no risks will be taken. Richie_Rich, DudeWah and DonKnock like this. It embarrasses me. I've seen it for years and you'd think that I would get used to it, but I haven't. The images J.R. posted earlier tell the story, and if you look closely, it isn't just the lower bowl that looks empty. 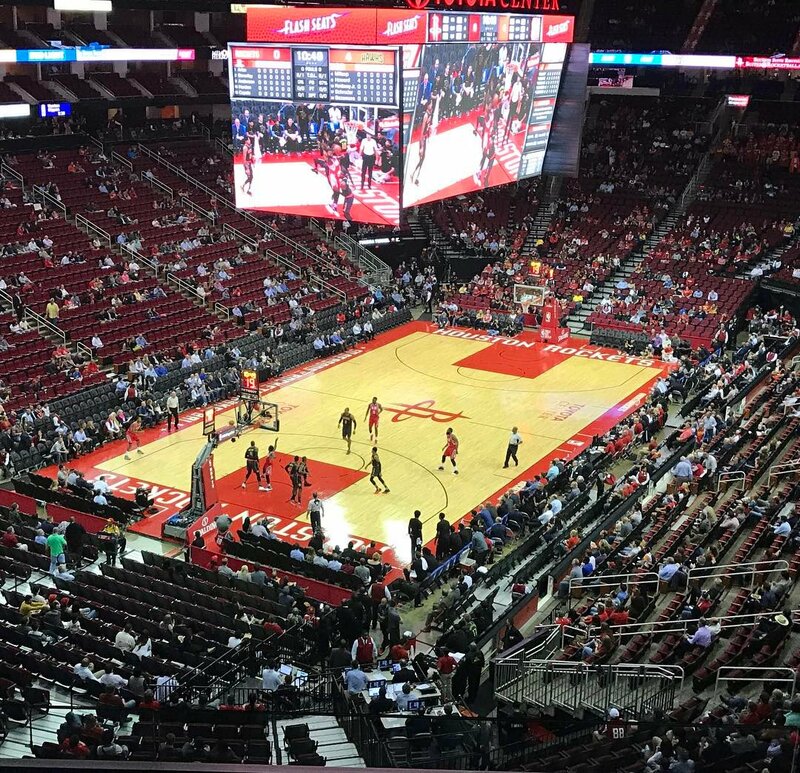 Until game times are moved back to a reasonable 7:30 or 8 pm, and ticket prices are made reasonable enough that ordinary Houstonians can afford to attend games with their family and friends, we'll see those empty seats. 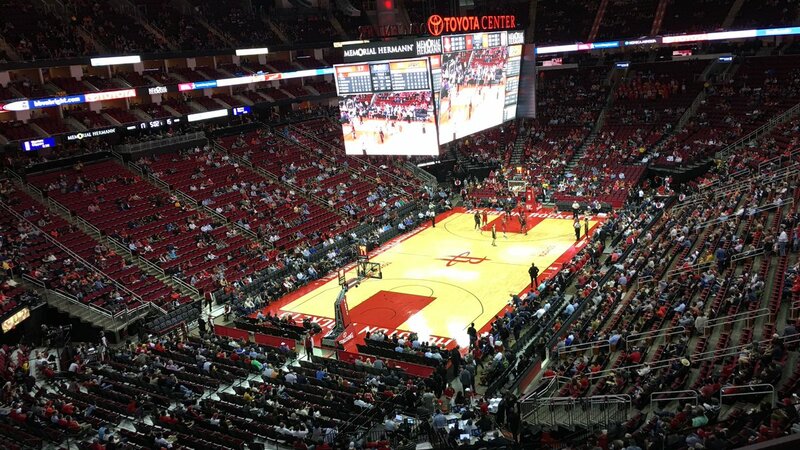 Empty because the corporate types couldn't be bothered to show up on time, or to give their seats that aren't being used to people that care about the Rockets enough to show up. Empty because they are just too damned expensive. I'm surprised that it doesn't bother Alexander enough to do something about it. I guess it comes down to the bottom line for Les. As long as the dollars flow in and the value of the franchise goes up, he's happy, apparently. 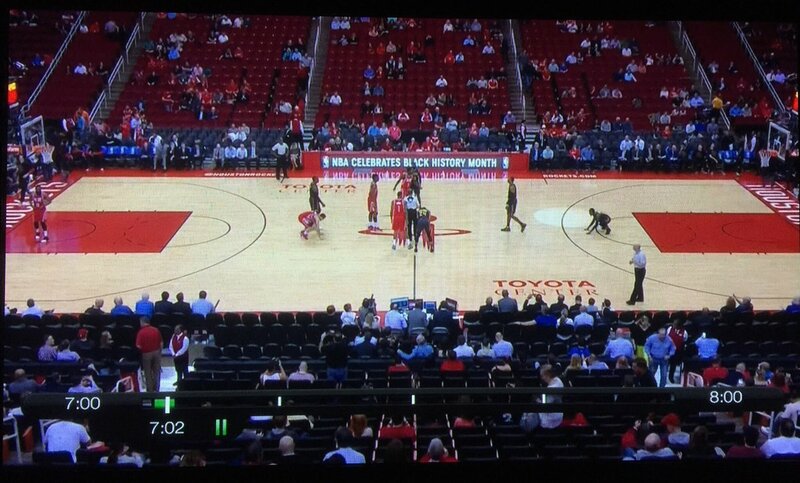 Houston looks like it can't support its NBA team on TV and the city takes a public relations hit? Alexander doesn't seem to care. Richie_Rich, DudeWah and RasaqBoi like this. Ewing on Yao:"he was more American than anybody else." Is anybody else starting to HATE Ric Bucher with a passion?